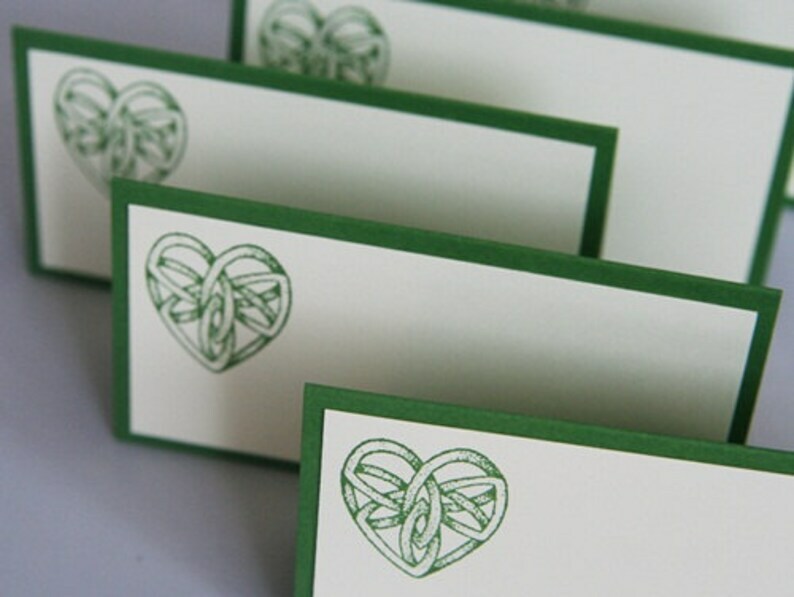 Celebrate love and a Celtic heritage with these hand made heart place cards. Perfect for seating your wedding guests as well as using for food tents and labels, your reception elements will all match in a simple and elegant way. The heart image was hand stamped in green ink onto ivory card stock. The base is a matching green card stock. **Need a large number of these for your event? Feel free to contact me and I can create a custom listing just for you. • The place cards measure 4 x 2 inches when folded. They will come to you scored and folded. Beautiful place cards for a St. Patrick's themed Bridal Shower. Shipped quickly!